We decided to send our two children to Mary, Mother of God School because we want them to receive the best truly Catholic education. Through the dedication of the teachers, my children are nurtured in a loving and respectful environment which strikes a balance between spiritual nourishment and academic excellence. The curriculum for Grades 1 through 8 has been selected and carefully developed to provide the students with a rigorous but balanced academic program. It makes the most of a wide variety of resources, including special visitors, informative and engaging texts, and audio and video materials. The teachers are continuously trained to ensure that their methods of instruction are effective and that they meet the specific needs of each child. The content of the program is transmitted directly by the teachers and explored by the students themselves in projects, presentations, class discussions and activities, regular homework, and tests. Manipulatives are used to advantage in subjects such as Science and Mathematics and are especially useful in helping the primary students to grasp concepts. The children are taught to think critically and to ask questions and have ample opportunity to express themselves. They are encouraged to pay attention to facts, as well as to their own impressions and the deeper meanings of what is studied. The Language Arts program consists of Phonics (for Grades 1 and 2), Spelling, Grammar, Reading, Literature, and Writing (both expository and creative), while the Mathematics program includes both problem solving and drills. French begins in Grade 1, as do Science, Music, Drama, and Visual Art. These subjects continue through Grade 8. 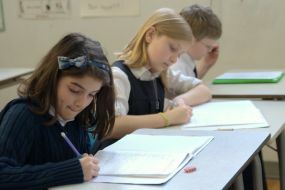 The students study Latin from Grades 5 to 8. History and Geography are taught as Social Studies units for Grades 1 to 6, and as separate disciplines for Grades 7 and 8. Religion is also a key component of the academic program.